Woolly mammoths were animals that looked like elephants. They lived in northern parts of Europe, Asia and North America over 11,000 years ago. They are extinct. We know a lot about them because whole bodies have been found frozen in Siberia and Alaska. Early people in Europe drew pictures of them on cave walls. They had long shaggy coats of brown or black hair over fine, short under hair. They had dark gray skin and thick layers of fat that kept them warm. They ate grasses and shrubs. They chewed the tough food with broad flat teeth. In their life, they would grow 24 teeth, just like modern elephants. A fully-grown adult had 4 teeth when one tooth was worn down, another came forward from the back of its mouth to take its place. 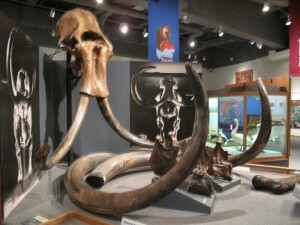 They had long curly tusks that were probably used for protection and to dig grasses from under ice and snow. The young mammoths were hunted by the Scimitar Cat, American Lion, and people (Paleo-Indians). 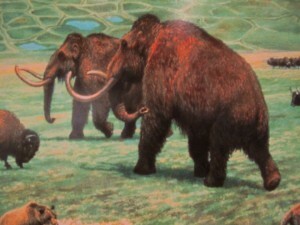 The adult mammoths were hunted by the Paleo-Indians. Their meat was eaten, the skins were used, and their bones and tusks were used to build houses and to make tools and jewelry. Who is the artist of the illustration?